Closing in on midnight, and the Christmas party was winding down. I remember the night well, even though it was 1984. Someone walked up to me and asked, “You that writer fellow?” I allowed that I was a writer. Because I liked the sound of that better than saying I was a magazine editor. I wanted to be a writer. After all, I was living in Fairhope, where Bill Butterworth, whose best-known pseudonym is W.E.B Griffin (there are about a dozen others used by this man who has some fifty or sixty million books in print), said to me, “Fairhope, Alabama, the home of more writers than readers…” Enough writers that it was true to say there were more published authors, per capita, in the town than anywhere else in the United States. The Chi Tree at Waterhole Branch. It’s not huge and twisted like some of its near neighbors, but venerable and wise, and full of stories to tell. But I was not one of them. Not yet. Still, I was writer enough that the guy who asked me the question would lead me that night to the subject of my fourth novel. “You know about the big tree?” he asked me. I told him I knew about a lot of big trees. I know how trees are the stuff of stories and poems. “No,” he said, leaning in closer, “the big tree.” Maybe I don’t know that one, I said to him. Tell me about it. “Better yet,” he came back, “why don’t I just show you?” I hedged. We’d both had some drinks, it was late, it was cold and windy. But he had, in fact, called me a writer. So, we loaded up in his car. What happened that night led to the scene that is the opening of The Widow and the Tree. It’s the story of a treasured giant live oak, maybe five-hundred years old, and how in October, 1990, it was “murdered,” as the national news media put it. And I wanted to tell a story of a tree, and the dark mystery of its death at the hands of a woman who loved it. Here is the beginning of the book and the scene that introduces the tree. IN THIS MYSTERIOUS COUNTRY OF BACKWATER BAYS and slow-running rivers where bull alligators rumble the nerves of lesser creatures, the widow’s tiny house looked like a child’s toy abandoned on the dark landscape. A faint smell of woodsmoke hung in the cold December night, and it might have been stronger but for the stillness that let the ghostly scent escape from the brick flue and rise straight toward the full moon. Viewed from the quiet river, across a broad savannah of marsh grasses, the gray ribbon of smoke looked attached to the chimney top, as if put there for lifting the house off the world. Another view, from high above the bank of trees: a quarter mile downriver the curving shell of the veteran’s 1960s Airstream caught and reflected the moonlight. Beside the trailer, like a winking jewel on the ground, a campfire burned clean with only a pale thread ascending into the black sky. 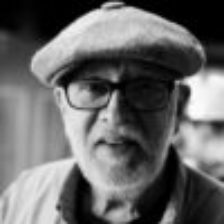 There up the river just a ways, the bait house windows were shuttered until dawn brought boats alongside its dock and pickups into the parking lot and the sagging floor creaked underneath the shoes of fishermen and coffee drinkers. Soon enough a stir of wind would fray the smoke from the widow’s chimney, twist it into tendrils, make a man want to turn up his collar and tighten his shoulders. But now, these two men who crept along the path took no notice of the air’s chill, only looked ahead toward a hummock fronting a dark treeline. “You see Ghosthead Oak now?” The game warden asked, stopping to catch a better breath, pointing ahead. “Look. It’s the size of a goddamn hill.” The path had widened and the two men stood side-by-side. He stopped on the path. He saw there rising from the moonlit sway of tall grass, a tree unlike any other he’d ever seen. Nor would he see its match along the whole of the Gulf coastal crescent from New Orleans to Apalachicola. 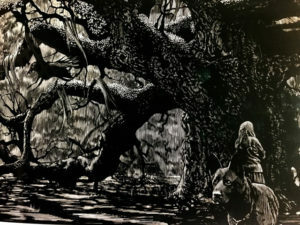 For though it was a live oak, and such were plentiful, squatting the land, low and broad with their gnarly twisted trunks and furrowed bark like the hide of some ancient thunderous beast, there was not another tree the equal of this one. 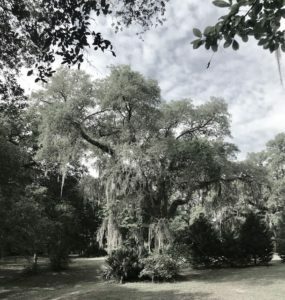 Live oaks grew easily and spread their canopies wider than houses, many with trunks the size of whole rooms, and Ghosthead Oak was the king of them all in this backwoods landscape, or even those owning land and guarding bronze plaques in city parks. The rough-barked limbs of the live oak before the deputy drooped under their own weight and length, dipping close to the ground at two-thirds their hundred-foot reach, the ends of the branches turning up toward the sky like the palms of a conjuring sorcerer. Ah, we started that book in AL and finished it in WI. Great story in every way. Appreciation for how much you bring us readers up close & inside – a rich experiment. Gracias.